The world’s largest pumpkin festival is home to some 400,000 pumpkins. It’s held each year in Ludwigsburg, Baden-Württemberg, Germany, located just 17 km north of Stuttgart. The Ludwigsburg Pumpkin Festival is great for both kids, and kids at heart! See more places to travel in Germany. The first time I went was three years ago, albeit reluctantly. My German partner at the time dragged me. He said it would be fun. Having never been to a pumpkin festival and not really wanting to go, I thought it sounded cheesy and something just for kids. 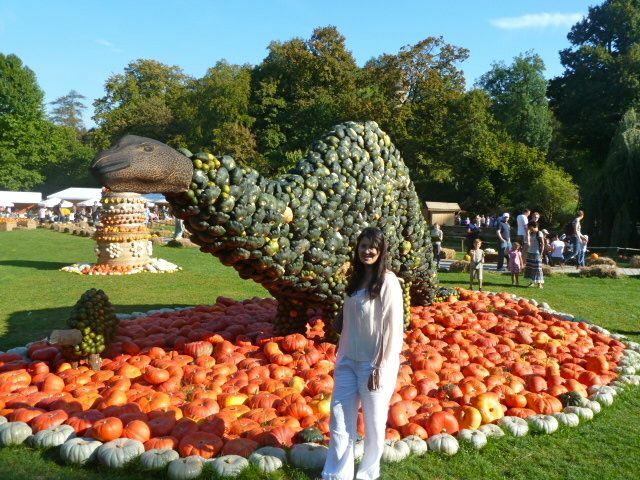 Me posing with the mama and baby dino at the Ludwigsburg Pumpkin Festival. Kids loved seeing the dinosaurs, but so do kids at heart, at least I did. In 2016 the theme was Pumpkin Circus, which was fun! It’s a great place to get some pumpkin carving inspiration, including some that are easy to do at home, aka, not life-size! Not surprisingly the world’s largest pumpkin festival is an excellent place to buy a pumpkin. You’ll find different kinds from all over the world. Get your pumpkin carving toolkit ready! Anything pumpkin is also available, including pumpkin pasta, pumpkin beer, pumpkin spiced coffee and my personal favourite pumpkin sparkling wine. I know that pumpkin and wine sound like a strange combination, but it’s actually really good. I love serving it to guests, as it always takes them by surprise. Last year I bought 6 pumpkins and we ate pumpkin something or another for almost 2 months straight. I’m dying to try pumpkin pasta, but as I have a gluten allergy, I made some delicious pumpkin risotto instead. I had never heard of pumpkin sparkling wine before last year and tried it out of curiosity with low expectations. Since trying it I’ve never left with less than 2 bottles and that’s with J.P. constraining me. In keeping with the theme you can also eat an assorted variety of pumpkin goodies so go hungry. My favourite is the pumpkin soup, which is consistently the best I’ve ever tasted. J.P. tried the Pumpkin Rösti (fried grated potato) which had an interesting flavour, although I wouldn’t have wanted to eat a whole plate of it. The Maultaschen (the German take on ravioli invented in nearby Maulbronn) looked amazing as well. The Maultaschen (pictured at the bottom) looked heavenly. Unfortunately, I’m allergic to gluten so didn’t try it. This textured bump covered pumpkin was from the United States. This odd shaped pumpkin came from France. The festival is behind Ludwigsburg Palace, one of the largest Baroque buildings in Europe. Just walking through the palace gardens and grounds is worthwhile in itself. However, seeing the contrast of a palace and pumpkins is really something else. It also is my favourite castle tour in all of Germany and I’ve visited a lot of castles in Germany. You can easily combine it with the festival. If you do decide to do the castle tour and are doing some other sightseeing in and around Stuttgart, consider the StuttCard. It gives you free entrance to the castle. The impressive Ludwigsburg Palace is the setting for the pumpkin festival. 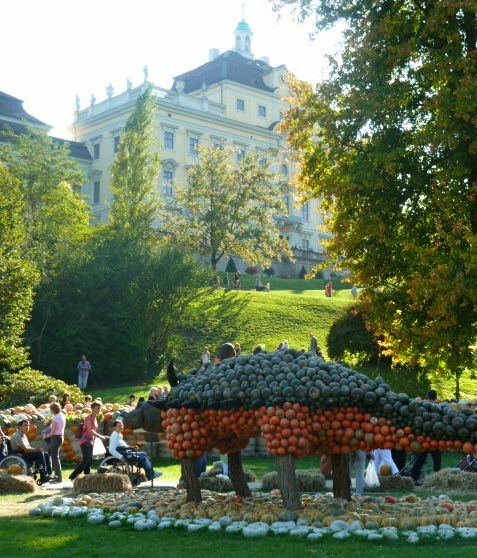 You don’t see a palace and pumpkins every day unless you live in Ludwigsburg. The theme for 2018 is Pumpkin Forest. Your ticket also includes entrance to the fairy garden, which children will enjoy. Allow several hours to visit the festival, more if you also want to do a palace tour, which I highly recommend. If you’re travelling by car, I recommend Schlosshotel Monrepos. It’s a 4-star castle hotel situated on the lakeshore of Monrepos See. You’ll find a golf course, riding stables and wine estate there. It’s a 10-minute drive to the centre of Ludwigsburg. If you don’t have access to a car, nestor Hotel Stuttgart-Ludwigsburg is a better choice. This 4-star hotel is just 400 metres from Ludwigsburg Palace. It features 19th-century brickwork design, elegant rooms and a traditional German bakery. More information about the Pumpkin Festival can be found here. Note: This article was originally published in 2011 but was updated in September 2018 to provide the most up-to-date information. Funny! When I lived in Germany, the people in my community didn't believe me that you could eat pumpkin. They believed it to be completely inedible & thought I was lying about pumpkin pie at Thanksgiving. wow, that pumpkin festival looks better than the one I went to years ago in California. I like how they use pumpkins to make the dinosaurs! so cute. your post reminded me that, it is pumpkin season and also time to make pumpkin pie! What a fantastic way to welcome in all the festivals of harvest time! I can't believe all of the variety of pumpkins and the magnificent sculptures on display. This festival looks like so much fun and your pictures convey it well! A very interesting post. Amazing Palace. We have a boatload of humble pumpkins in Canada and I am ashamed to say we have not taken advantage of this opportunity at all. This post reveals a host of great ideas beyond pies, soup and Halloween carvings. Excellent photos. Wow, that is fascinating and creative. Not only are the pumpkins and dinosaurs fun to look at but what a beautiful location! That looks awesome. Well, except for the wine. The rest, totally awesome. Well, it's original! Never seen sculptures made of pumpkins! I don't mind squash (soup, stuffing for pasta etc. can be very good) but I get slightly annoyed when in October everything becomes something-pumpkins. Pumpkin pies, pumpkin spice drinks etc. Give me back my chocolate instead! I like the sound of the wine :) It certainly seems as if some people out there are deadly serious about pumpkins! Oh gosh I so want to see this, the I am thinking maybe Sunday as the weather is still so nice, although there is a Weinfest in Göppingen which finishes Monday... oh too many decisions! No I haven't but now I'm totally adding that to my ever-expanding list of places I'm dragging my husband to lol. Pumpkin food is really hit or miss for me. I don't really care for most of what I've tried although I did have a pumpkin spice doughnut the other day that was delicious. But this seems like a fun fall activity regardless and it's only about an hour from where we'll be living. It ends a few days before we'll be landing in Germany so that'll have to be an idea for next year. I was there too! I actually had to look closely to see if you stole my photos (j/k). Going back in a few weeks, what else can you recommend? It's a great place to go actually. The photos are awesome. Can't believe the dinosaurs can be made of pumpkin. The food looks very tasting. Sounds like a great family day off. Thank you Laurel for the amazing pictures and the interesting article. I wish there was more festivals like this where I live. Seems like a lot of fun! Btw, sad to hear your gluten allergic, my mum is that too and I know it makes life quite difficult at times and especially when travelling. Greetings from Finland. @Viktor - I love festivals, many more in Germany, than in Canada, where I'm from. I found it really easy to be gluten-free in Finland. Even the gluten-free bread was really good! Are dogs allowed? Is there an entry fee? @Krissy, the entrance price for 2014 is €8.50 per adult. Not sure whether dogs are allowed, you would have to check the official website. I found your blog while looking for a recipe to recreate the maultaschen we had at the festival this year. I can confirm that it is AMAZING. :) We have been back in the States for two weeks and I am craving the stuff. @Jen - Glad to hear that you enjoyed it! I wish that it wasn't so time intensive to make at home. Awesome! I haven't seen a pumpkin festival before. I guess this is fun. I just can't believe there's a lot of things to do with pumpkin. Even the wine and pasta is made up of pumpkin. What else pumpkin can do? I hope there's a cheap made of pumpkin too. Thanks for sharing. I enjoy reading your post. @Annika - I was surprised by how much I enjoyed the pumpkin festival. I'm on a pumpkin recipe kick lately, which has included, pumpkin soup, risotto, chicken, and even curry. @Terry It's definitely something to see and each year they have a different theme. I went yesterday and this year it was a circus theme. Hope you're able to visit a pumpkin festival sometime.